Following the Gear S3 Frontier’s launch at T-Mobile last year, Samsung has said that the Gear S3 Classic will soon be making its way to T-Mo, too. Samsung today announced an LTE version of the Gear S3 Classic. Like the LTE Gear S3 Frontier that launched in November 2016, the Gear S3 Classic features a 1.3-inch 360×360 Super AMOLED display, dual-core processor, 4GB of storage, 768MB of RAM, and a 380mAh battery. 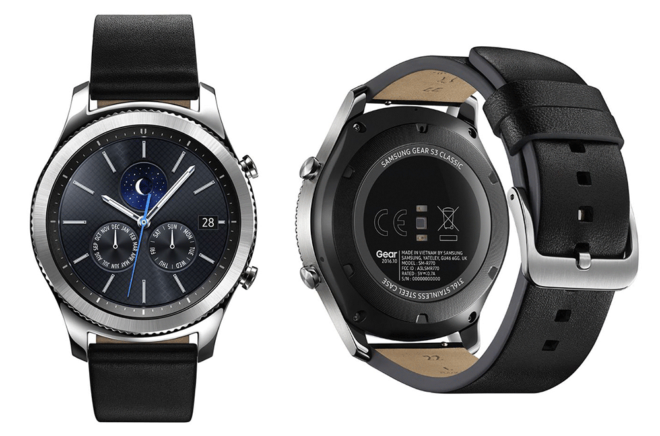 Also included with the Gear S3 Classic is NFC and MST for Samsung Pay, GPS, a heart rate monitor, an ambient light, an accelerometer, a gyroscope, and a barometer. All of those features are crammed into a case that’s IP68-rated for dust and water resistance. On the software size, the Gear S3 Classic runs Tizen 2.3.2. The wearable can be paired with devices running Android 4.4 and up as well as iOS 9.0 and up, so long as they’ve got at least 1.5GB of RAM. Because the Gear S3 Frontier and Gear S3 Classic have similar spec lists, the one big difference between them is their design. While the Gear S3 Frontier has large ridges all around its case, the Gear S3 Classic has much smaller ridges for a more traditional watch look. When asked for launch date and pricing information for the LTE Gear S3 Classic, T-Mobile said that it doesn’t have any info to share right now. So if you’re interested in strapping this smartwatch to your wrist, stay tuned for more launch details. I want it. Beautiful watch. I have the Samsung Galaxy S7 and Note 4, great addition. I also have iPhone 7 and SE. I didn’t buy Apple Watch because of lack of LTE and features. Thank You Samsung. Another explosive device from Samsung, no doubt. And, like the others, slated for a flaming success. I can see that people are already burning with anticipation. This device will reignite the public’s interest in smartwatches. I see what you did there. That was hot. Any news on this yet? I am impatiently waiting on this to hit stores.